Tiger Pose simulates the stretch a tiger makes when it wakes up. It is a super delicious spinal lengthener and backbend. Use this posture to stretch out your entire front body, from your ankles all the way through your thighs, abdomen, chest, and up to your throat. 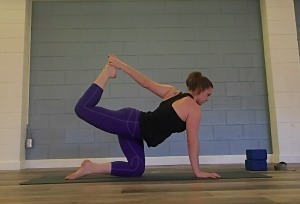 It's a great pose to practice, and here's why you should! The back bend in Tiger Pose helps to ignite the adrenals and nourish the kidneys for those of us with stressful daily lives. This stretch can become a wonderful chest opener when using the bound variations. Opening your chest is great for asthmatics, and also for allergy sufferers. In Chinese medicine, it helps to relieve anxiety, depression, and grief, too. Tiger Pose should be avoided if you have a chronic back condition, but it is strengthening for healthy lumbar muscles, so can help prevent back injuries when taken slowly, one step at a time. There are several options in Tiger Pose, and each one starts from a Table Top position. These variations start from the most basic, and go to the most advanced. The first option is often called “Song Bird” in Stand Up Paddleboard Yoga. It is mostly core work and balance training. From Table Top, stretch one leg back, parallel to the ground with your foot flexed. Your goal is to keep your hips level. Now lift the opposite arm out in front and try to stay balanced. Maintain a straight line from your fingers through to your heels as much as possible. The second Tiger option is referred to as a type of Donkey Kick in Power Yoga. It encourages a slight backbend and is a hip strengthening activity. From Song Bird, bend the lifted leg so your heel is "donkey kicking" up to the sky. Bound Tiger is the more classic variation. It stretches out your ankle and quadriceps. This variation is similar to Dancer Pose, but on your knees. From Donkey Kick, grab your foot or ankle with the opposite hand and kick up. As in Dancer Pose, make sure your hips stay level so you are not over extending those ligaments. Try using a strap to help you grab your foot. This will also provide more length for your spine and avoid that crunchy feeling. Keep your knee pressing in to your midline and pull your stomach in to support your spine as you deepen your backbend. After a while perhaps you start to look up, testing your balance. King Tiger, with its overhead toe grab, is the deepest and most difficult variation. It rotates your shoulder for a deeper chest opener and backbend. This is very challenging, so don’t be upset if you’re not there yet. There are various ways to help the toe grab happen using the wall, a strap (as I did), or a fancy elbow-wrist twist. However, all of them require you to have a warm and supple spine, and open shoulders and chest, so work those areas first. It’s about the journey, not the destination, after all. Never force an overhead toe grab in any of your postures, as over extending your spine can lead to a back injury quickly. Also, if you know you tend to hyperextend, overhead toe grabbing can be degenerative unless your hip and back muscles are strong enough to engage and hold you up. Think strength and flexibility in equal parts for your whole practice. If you are very flexible, work more on building strength, and vice versa. This is a kneeling posture, so you may decide you want a blanket under your knees for padding. If your wrists are tender for any reason, you could use your fists instead of flat palming. Using your fists in Tiger is actually more challenging for your balance — which means more core work! It is also a great way to strengthen your wrists and resolve tenderness. Alternatively, you could also try all of these options on your forearms. Some will be more challenging down low, while others will feel a little less strenuous. Always remember, the “level” at which you practice has nothing to do with how deep you take a particular posture. Your advancement in yoga is based on your commitment and mindfulness in the moment. One day maybe your toe will touch the back or the top of your head in Tiger Pose! Until then, take it slow and appreciate the benefits of all the different options as you build your practice with Tiger Pose.